Modern punk rock will never be the same. Two of the genre's biggest hitters, Epitaph's Rancid and NOFX deliver spellbinding covers of each other's material. Seventy-seven punk rock meets street Oi! 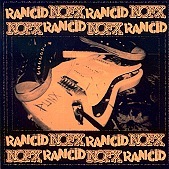 with pop spilled all over, Rancid's blistering punk shines as they tackle the sweet, melodically ripe NOFX. Songs such as "Moron Bros.", "Bob", "Don't Call Me White," and "Brews" sound timeless, re-invented and re-told by a punk band that will surely go down in the history books as one of the greatest. Then there is NOFX, taking Rancid's Oi!/'77 style into the pop-punk realm, making them sugary to the last drop, emphasizing melody and hooks (and humor) over blistering guitars and gritty vocals. Fat Mike and crew turn "I'm The One", "Olympia, WA", "Antennaes", and "Radio" (to name a few) into fast, chaotic pop-punk standards. This is a must have for pop-punk, Rancid, or NOFX fans. This is a glowing example of why punk isn't dead. I'll give it an A+.